We use GUINOT, ELEMIS & DERMALOGICA in our salons. Guinot, Elemis and Dermalogica products are used in our facial care treatments and they are available to purchase in our salons. A superior facial with an international reputation. A monthly deep cleansing, regenerating Hydradermie facial will keep your skin in optimum condition. The therapist will customise the treatment to suit your skin type: de-hydrated, mature, oily, sensitive or pigmented. Hydradermie 2 Age Logic – The Anti Ageing Star Treatment! A specially designed anti-aging Hydradermie2 facial that concentrating on the eyes, face and neck areas. The massage treatment includes cleansing, exfoliation, mask and mild galvanic stimulation. The Guinot Hydradermie Age Logic treatment is amongst the very best anti-ageing technique to visibly rejuvenate your face and neck. Hydradermie Age Logic redensifies the skin, revitalises and smoothes wrinkles and gets visible results even after the first treatment. Signs of ageing will fade on your skin and your face will have regained firmness and radiance. The unique mask contains living cell environments (vitamins, amino acids, trace elements) which play a part in cell regeneration plus ATP (Adenosine Tri Phospahate) the biological molecule which transports and transmits cell energy to the skin. The ATP triggers cell activity, which has become dormant with time. Vitamin C stimulates the synthesis of collagen and brighten the complexion. Double Ionisation allows for optimal active ingredient penetration and oxygenation to bring your radiance back. Finally a face massage in the expert hands of your beautician, relaxes your facial features and facilitates cell exchanges of the nutrients within the facial mask. To obtain face-rejuvenation more quickly, we recommend having one Hydradermie treatment a week for three weeks. After your initial consultation, your beautician will choose the Hydradermie treatment products to be used according to your beauty aims and your type of mature skin. Create a natural facelift by lifting features through facial muscle stimulation. After the first treatment, you will see the visible results of lifted facial features. The skin has regained its tone and surface wrinkles have faded. This method is like “body building” for the face. The Hydradermie lift facial offers you an immediate lifting effect with gentle electrical facial muscle stimulation. In-depth biological cleansing allows the skin to breath and be more receptive to the products used in the treatment. Draining improves cell exchanges. From the first treatment stimulation makes the muscles of the face work; the muscles regain tone and lift the features naturally. We apply a serum gel to your face containing Biopeptides to recreate your skin’s elasticity, combined with the stimulating effect of special currents, which allow for facial muscle stimulation. Results can be seen even after your first treatment. To maintain these results, we recommend you have a course of six treatments, followed by one regular maintenance treatment each month. Guinot Hydradermie Lift Yeux is a complete non-surgical anti-ageing treatment for the eye area. This treatment noticably re-hydrates, tones and lifts the area round the eyes. To visibly rejuvenate your eyes, eyelids and crow’s feet, Hydradermie Lift Yeux stimulates and contracts sub-cutaneous muscles to promote your skins “fitness”. Stimulating the muscles electrically plumps muscles, increases volume and fills in the signs of ageing on the surface of your skin. Dark circles and puffiness (bags) around your eyes are reduced by draining and firming the tissues of your eye contours. From the first treatment wrinkles around the eye contour have faded. The skin is smoothed and the eye contour looks younger. In-depth biological cleansing which allows the skin to breath and be more receptive to the products used in the treatment. Drainage reduces puffiness around the eye contour. Stimulation in the eye contour and crow’s feet areas trigger muscles to work, resulting in the signs of ageing being filled from the inside. Massage reduces signs of fatigue including dark circles. To maintain results, we recommend that you begin with three treatments in the first week, followed by one maintenance treatment a month afterwards. The Liftosome Facial treatment is best suited for mature skins, and aims to energize, tighten and firm using Vitamin C to brighten the skin. Liftosome relaxes features, smoothes away fine lines and adds a luminous glow to the complexion. Since both age and fatigue encourage sagging skin and a diminution of firmness caused by a combination of factors, this facial has been directly targeted to repair the damage. Designed as more than merely a “lifting” treatment, the Liftosome facial acts on two levels, vertically for a firming action and horizontally to tighten the skin. Visually its effects are immediate with skin visibly enhanced at the end of your treatment. Firstly your face, neck and eye area are cleansed and a Firming Serum is then applied with light effleurage (feathery) movements until completely absorbed. The serum is a cocktail of Vitamin E, Vitamin F (two essential fatty acids) and Vitamin C to stimulate and invigorate, Hyaluronic Acid to moisturise, Soya Extract to stimulate synthesis of collagen fibers, Horsetail (plant) extract to help restructure the elastic fibers to start the tightening process. Next the Firming Creme is applied in a thick layer over the entire face and neck. This is a stimulant to cellular activity, the Creme is a formulation of Phylderm for Oxygenation and the boosting of cellular activity, Collagen to firm and restructure tissues and Ginseng to help regenerate your cells. Your skin is now prepared for the final step, the Lifting Modeling Mask. A smooth paste of Orange extracts containingVitamin C is applied over a gauze and left on your facial area for fifteen minutes until it dries and hardens. You may feel the mask warming as it it does so. After the mask is removed, your skin is rinsed with water and toning lotion and to finish, your face and neck are coated with the lifting massage gel. This gel Contains a cocktail of plant extracts and vitamins which will leave your face looking and feeling firmer and tighter. The Guinot Aromatic (previously known as the Guinot Aromatique) facial uses natural essential oils and plant concentrates to bring natural beauty to your skin. This treatment isparticularly recommended for dehydrated skins as the essential oils diffuse their precious active ingredients, re-hydrating the skin. At the end of the treatment your skin is more luminous and comfortable. Your face appears healthy and well rested. 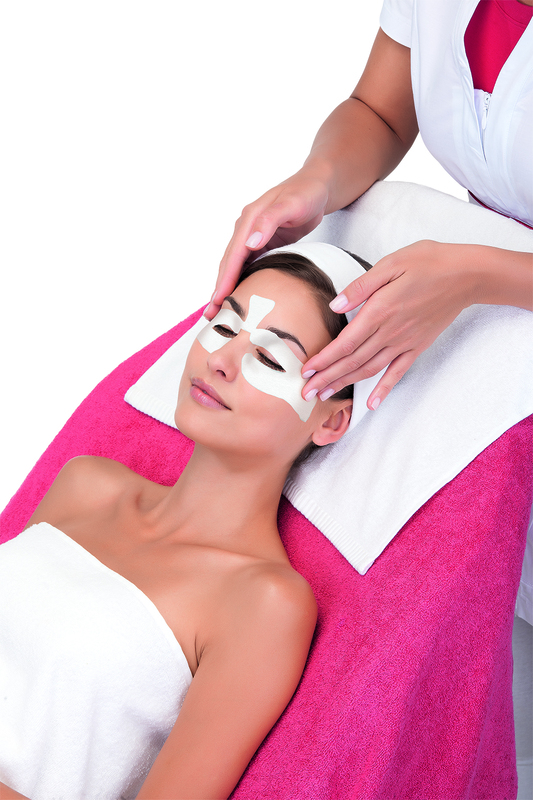 Your skin is unique and all Guinot Aromatic facial treatments are personalised to your unique requirements. So whatever your skin type, you will still receive the benefits of essential oil massage techniques which fills your skin with energy and provide you with a long-lasting and balancing effect. The essential oils are applied using the Guinot Aromatic Mask which is mixed by your beauty therapist who will have selected the blend of essential oils for your skin. The energy of essential oils is ideal for dehydrated skin while the soothing aromatic scent calms you. You will feel incredibly relaxed and your skin will regain its suppleness, radiance and softness. The treatment ends with a plant extract mask, from which your face will emerge new and radiant. Digital pressure movements relax the face and release tension with every exhaled breath. Your beauty therapist will recommend products to you in line with your hydration goal and the condition of your skin, to prolong the beneficial effects of the treatment. 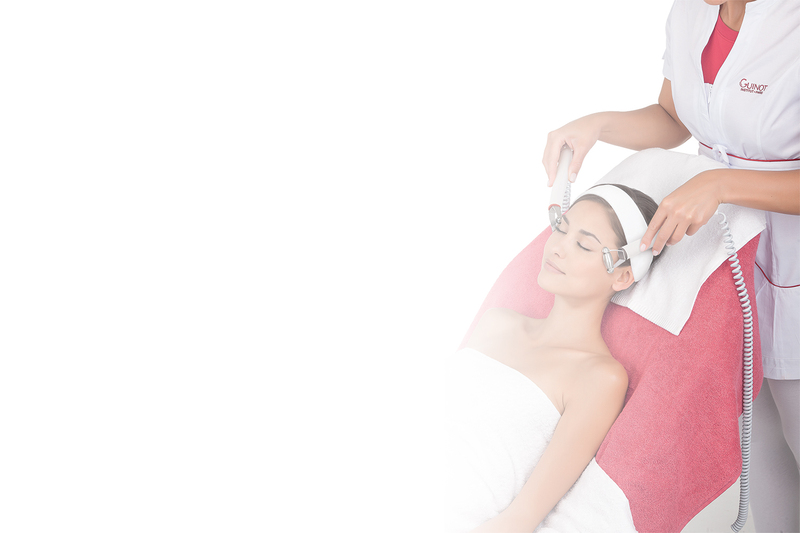 We recommend a Guinot facial every 4 weeks for your skin to recover and maintain its’ natural radiance. The Hydraclean treatment is designed to cleanse the face paying particular attention to the T-zone, thanks to the only treatment method of its kind. The Thermoclean heating electrode diffuses gentle heat that rids the skin of toxins and excess sebum. A 30-minute treatment combines deep cleansing and a relaxing massage, leaving the skin clear and radiant. The pinnacle of anti-ageing treatments, Age Summum used pure Vitamin C, Hyaluronic Acid and Pro-Collagen to target the signs of ageing – lack of radiance, loss of firmness, fine lines and wrinkles. Skin is treated with a dermabrasion exfoliating cream, a regenerating anti-ageing serum, and an active Pro-Collagen mask. Ingredients are penetrated into the skin using the exclusive Age Summum anti-ageing facial massage. Designed for skin challenged by modern living. Rebalanced, re-mineralised, renewed. This face and eye treatment is pure soothing heaven for sensitive skin. A powerful purifying facial treatment that helps to calm irritated skin and rebalance pores leaving a beautifyl matte skin. Instantly firms, plumps and rejuvenates the skin. Clinically proven to increase elasticity by 40% after just one treatment. An advanced anti ageing facial, clinically proven to reduce the number of wrinkles by 94% and improve skin firmness by 57% after just one treatment. Peel away the years for smoother renewed skin with this ground breaking anti-ageing facial. Your skin will be left incredible clean, smooth and radiant. Skin is deeply cleansed and stimulated by specialist Eastern massage techniques, whilst powerful conditioning actives nourish and renew vital radiance. Following a specialist facial massage, the skin is fed with thirst-quenching actives that will bring back that healthy, dewy look to the skin. Deeply cleansing to draw out skin impurities, this facial will help reduce unwanted shine, refine the pores and treat skin breakouts. Recommended: 1 treatment every 2 weeks. Bristol’s ultimate Dermalogica facial is a proven system of skin care and body therapy success for qualified professionals and conscientious consumers. 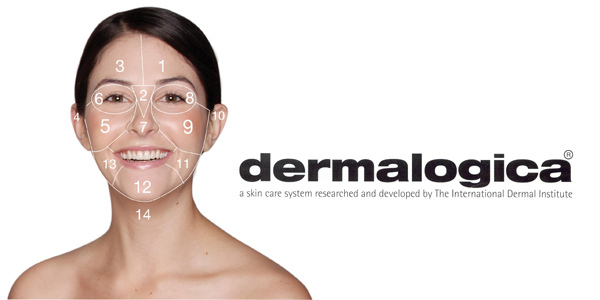 The unique approach to skin care pioneered by Dermalogica is based on several important differences between Dermalogica and some other skin care product. Dermalogica HAS NO MINERAL OIL- it uses lightweight, natural vegetable oils as alternative emollients. HAS NO LANOLIN – Dermalogica uses aromatic essential oils and silk proteins as moisturizing agents. HAS NO ARTIFICIAL COLOURS – Dermalogica does not use artificial colour. The natural ingredients determine the final appearance of any Dermalogica product. The entire range of Dermalogica products are available to purchase/order in store. This is your core skin care treatment. As part of your consultation we will customise a cleanser and moisturiser mixed with a plant botanical suited to your skin. Your therapist will then double cleanse using your customised cleanser. Followed by a customised exfoliation, steaming and blackheads extraction, then serum and treatment masque. This thorough customisation ensures a sensational treatment which is different every time. A complimentary neck and shoulder massage is included. This complete facial achieves maximum results in minimum time. Power cleansing, a customised mask and moisturiser to complete the treatment. Combining Retinol (vitamin A) & hydroxy acid exfoliation to improve premature ageing caused by U.V. exposure & smoking, this treatment is for anybody wanting younger looking skin.